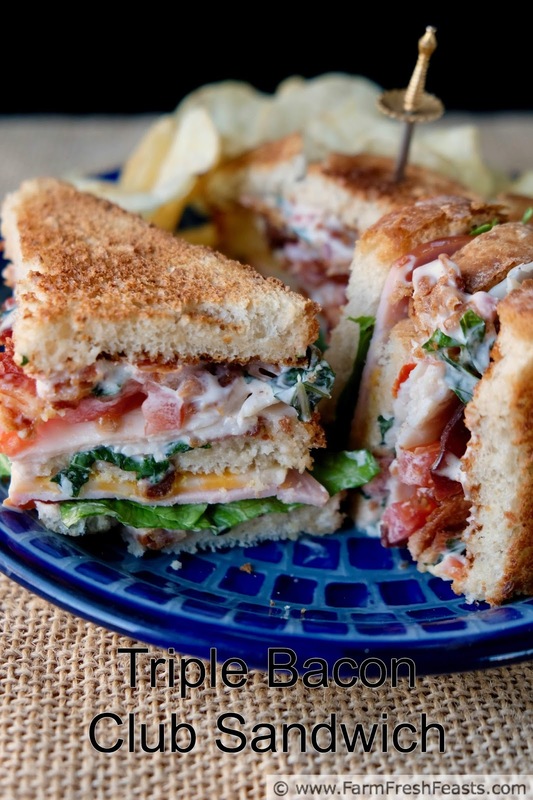 This triple decker sandwich is packed with bacon! Starting with crisp bacon strips, tender slices of Canadian bacon, and an amazing Bacon Basil Tomato Mayo spread--this recipe is perfect for a game day crowd or a satisfying solo lunch with a good book. The Ohio Pork Board asked me to write a post about bacon. I can't believe I'm getting paid to do this. I mean, bacon. A crisp slice of bacon, crackling as I bite into it and then dissolving in my mouth . . . well that's bliss right there. Creating this recipe was truly a pleasure, and I hope you enjoy re-creating because it's easy to make this restaurant-quality dish right at home! Bacon brings so much flavor to a dish, and because cooked bacon freezes well you can have some on standby, ready to layer on exceptional taste at a moment's notice. 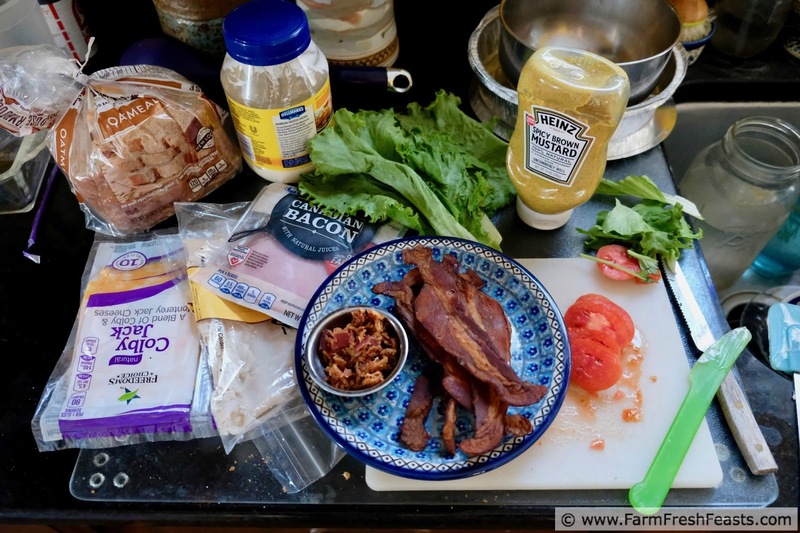 I always keep crisply baked strips of bacon on hand in the freezer--one oven session means I'm enjoying BLTs whenever the urge hits during summer tomato season. Are you ready for some football? Knowing my bacon post would go live in January meant that I'd share a recipe perfect for a playoff game party, and what's more universally liked than sandwiches? My brother once cooked at a bluegrass club and learned to make club sandwiches there, so I've seen how easy it is to set up an assembly line and make a bunch of sandwiches. With plenty of long toothpicks, you could have a platter of club sandwich triangles done and not miss a single commercial! Or play of the game. I meant not miss a single play of the game. I wanted to boost up the Bacon Factor of this recipe, so instead of plain mayo I created a Bacon Basil Tomato Mayo. 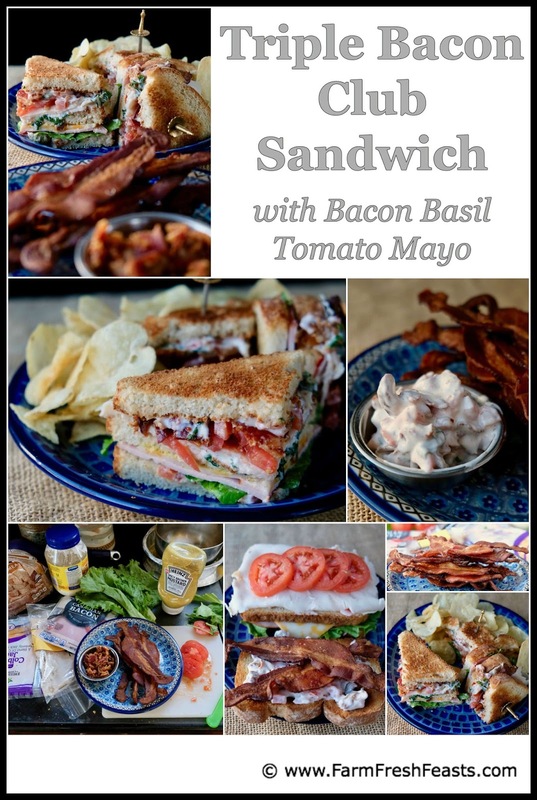 If you've ever experienced the pain of your first summer tomato appearing weeks after the heat has wilted your lettuce crop, you'll understand why my farmers celebrate the Bacon Basil Tomato sandwich, or BBT. I used that amazing flavor combo when dreaming up this spread. Through my work with Ohio Hog Farmers I've met lots of folks growing the pigs that become the bacon we pick up at the farmer's market and the grocery store. More than 3,500 family farms in Ohio raise enough pork to feed about 25 million people. So, when you buy pork at the grocery store or farmers market, you're buying local pork and supporting local farmers. While I've never cured my own bacon, at work I cook bacon in 10 pound increments so I'd like to think I've got some street cred. I bake it in strips and fry it for crumbles used for pizzas, pastas, and salads. My favorite way to prepare bacon at home is also the least labor intensive--I bake it. Using a rimmed baking sheet I lay out as many strips as will fit without overlapping. I put that pan in a preheating 375 Fahrenheit oven (I usually finish laying out the bacon before the oven is ready). I'll set the timer for 15 minutes. If the bacon is nearly done, I'll flip it over and return to the oven but turn the oven off. That's usually long enough to finish cooking to crisp--the best way I think. Once it's crisp, I stack the slices to one side and elevate the pan so that the bacon grease drains to the other end. Save that bacon grease! It's terrific for frying eggs, roasting vegetables, or grilling cheese sandwiches. So much flavor! When you're baking bacon strips, you can also add maple syrup, brown sugar, and/or honey for the last 5 minutes in the oven for a sweet salty finish. When I'm making crumbled bacon at work, I start by chopping a stack of slices into ½ inch pieces. I dump them in a wide shallow pot that has a heavy bottom, and cook over medium heat stirring occasionally. When the bacon grease is a creamy white foam it's time to drain the contents of the pot because your bacon is perfectly cooked. I made a video to share what perfectly cooked bacon looks like--please check it out! You can prepare the bacon days to weeks ahead of time and store it in the freezer. Let it come to room temperature before using. Make the Bacon Basil Tomato Mayo the same day you want to use it--several hours ahead of time is fine, but I wouldn't keep it overnight because the fresh basil will darken and the chopped tomatoes will make the whole thing watery. I recommend 2 types of sandwich seasonings, depending on availability in your area. If you've got a Penzey's Spices nearby, their Sandwich Sprinkle is amazing. If you don't, Crazy Jane's Mixed Up Salt is my go to shake to perk up tomato slices. Once you're ready to assemble the sandwiches you can slice the tomato and wash the lettuce, clear the counter tops, have a kid in charge of the toaster, and start spreading and stacking as fresh toast is ready. 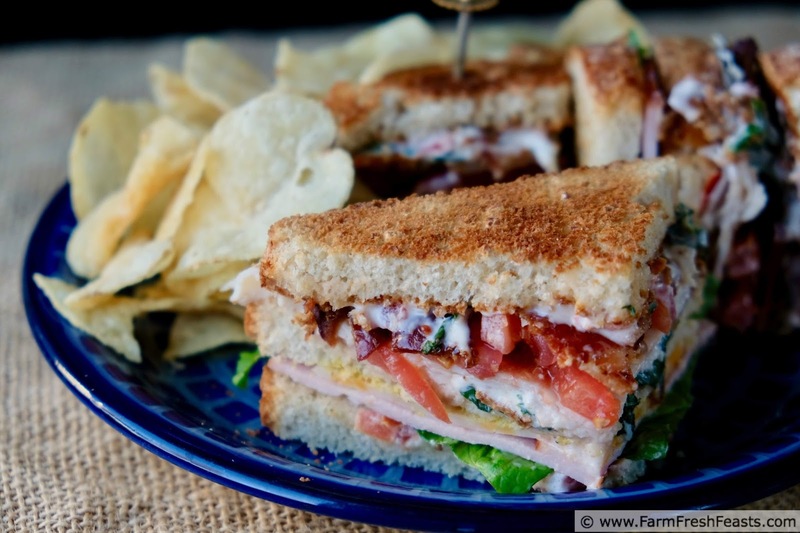 The sandwich really comes together easily and the recipe can be scaled up to feed a crowd. To make enough Bacon Basil Tomato Mayo for 6-8 sandwiches, I'd use ¼ cup chopped fresh basil and ½ cup each of the crumbled bacon, diced tomato, and mayonnaise. 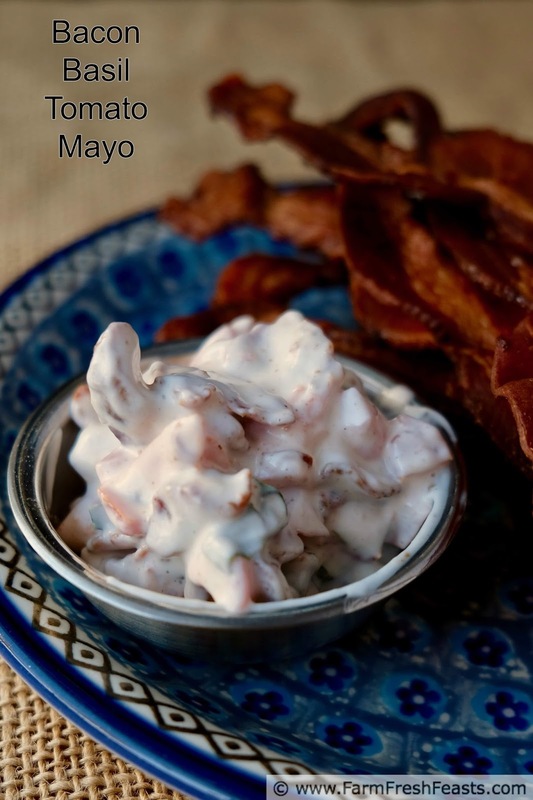 Make the Bacon Basil Tomato Mayo--combine the crumbled bacon bits with the diced tomato, basil, and mayonnaise in a small bowl. Add a pinch each of salt and pepper. Set aside. This can be made a few hours ahead and chilled. Spread each slice of bread with ⅓ of the Bacon Basil Tomato Mayo. Top one slice of bread with strips of bacon. Top another slice of bread with lettuce. Stack Canadian bacon and cheese on top of lettuce. Top with remaining piece of bread, BBT Mayo side down. Spread mustard on bare side of toasted bread. Top with turkey and tomato slices. Sprinkle sandwich seasoning or salt and pepper on top of tomato slices. 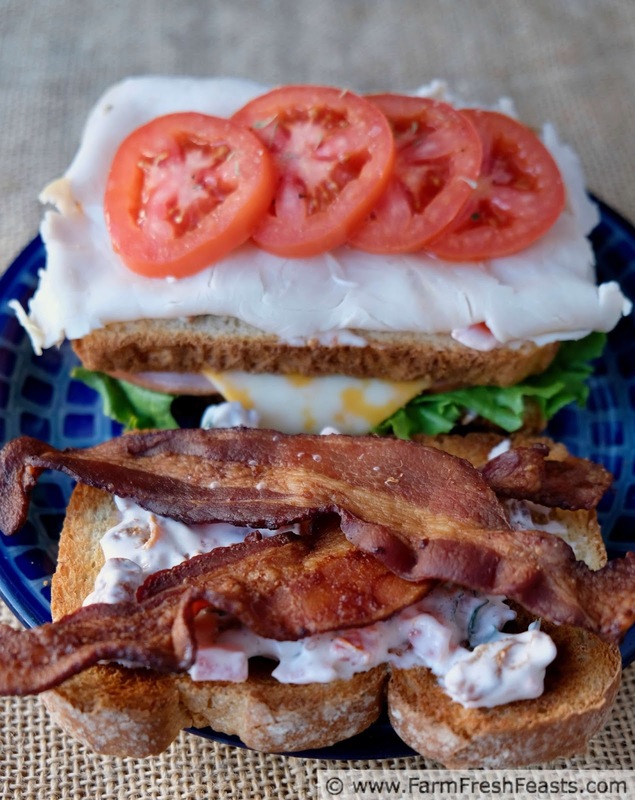 Finish sandwich by inverting bacon slices & bread on top of the tomatoes. Secure with 4 toothpicks, and slice into 4 triangles. For more recipe ideas, please see my Visual Recipe Index by Ingredient, a resource for folks like me eating from the farm share, the farmer's market, the garden, the neighbor's garden, and great deals on ugly produce at the grocery store. That looks delicious. You can never go wrong when you add bacon to a dish! I'm a vegetarian and even I eat bacon. In fact, I had some for breakfast yesterday, and this sandwich looks divine. I can't wait to try that mayo.